Video game hardware functionality has been a more-or-less static for decades. Consoles haven't changed in form, only in power, and computers are still the same kind of computers we had in the 80s. We have years of experience talking about these, and there are general ideas and practices that we just take for granted. How are the graphics and video performance? How are the controls? Load times? Game mechanics? Not everything is universally applicable, but we have a solid foundation to discuss the sort of video games we're used to. Trying to talk about VR experiences within the confines of traditional video games is a largely meaningless endeavor, "apples and oranges," as they say. Standard gamepads work exceptionally well in traditional gaming, but once you don the VR headset, flicking the joystick for a quick 180 will more often than not just make you ill. Motion controls in VR don't just need to be functional, they also need to avoid giving users motion sickness. Similarly, graphics are integral to an immersive VR experience, and there's a lot that can go wrong. Screen tearing is annoying on a monitor, but when you start seeing it in VR, your entire field of vision gets the effect, which doesn't so much give motion sickness as a raging headache. Finally, there's the enduring problem of new app stores and the samey shovelware they attract. 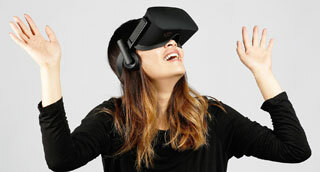 The Oculus store is more curated than the Steam VR section, so it's easier to avoid the chaff, but, like the early days of the App Store and Steam Greenlight, there are more VR gallery shooters than there were Flappy Bird clones, and plenty of them don't even work properly. 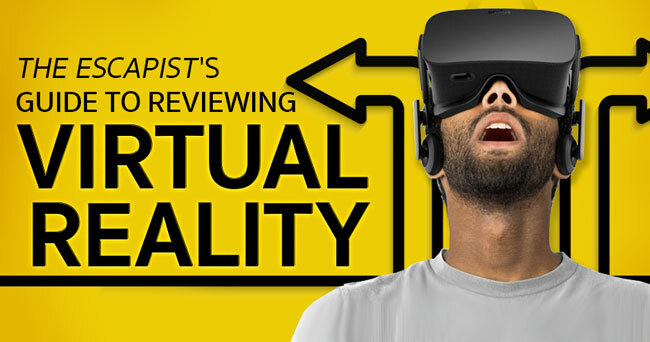 With that in mind, in the interest of bringing more VR reviews to The Escapist, we'll be using these guidelines to help keep things uniform, so it's possible to make meaningful comparative judgments. Virtual Reality is as much about the experience as the game, so things like the Google Earth app wouldn't be something I'd even consider writing about outside of VR. Of course, this debate has been raging for years, and there's yet to be a definitive answer, so for our VR coverage, we're going to go with, "It is a game only if you can win." It's a crude definition, but it serves its purpose well enough here. The Oculus Touch and VIVE controllers are very distinct from each other in form, and some games lend themselves better to the controllers than others. While we won't be breaking it down into these specific points, these will guide how we look at the controls. Comfort - Can you easily reach all the buttons from your hand's natural resting position? Intuitiveness - Do the controls make sense, or are they confusing? Movement mechanic - What style of movement (Teleport vs Walking, typically) and does it work well within the game? Responsiveness - Are there delays in controls? Is the aim accurate? Do the controls work properly every time? The visuals are typically the most important factor in VR immersion, so getting that right is essential. While most of the games at least have the basics down, you will encounter some with distracting or uncomfortable visual effects. Pixelated - Some games don't hide the pixels well, so you can see a field of little dots instead of a landscape. Dragging - If a game has consistent visual drag, it'll be nearly unplayable. Lesser cases aren't quite as serious. Glare - You'll often encounter a halo effect or glare from bright objects. It doesn't always impact the experience, but it certainly can. The gameplay component is the easiest, as it shares a lot with traditional game mechanics. With so many samey games out there already, novelty will be important here, as well as execution. Two games with the same mechanic may still be completely different because of a bad execution in one of them. Fun - Is the general gameplay enjoyable? Novelty - Are there 100 other identical games out there? If it uses similar gameplay to others, what sets it apart? Execution - Does it work as expected functionally, and is it easy to use in the game? Finally, we get to physical comfort, which is the one that imposes real restrictions on who can play. With different movement controls and graphics rendering, you can have very different physiological responses, and motion sickness is a real concern. It's also a physical activity, and some games will require you to be able to perform certain motor functions, in some cases hundreds of times. Motion Sickness - Can the game make you queasy, and to what extent? Physical strain - Cover mechanics in a shooter might require you to duck behind a wall by physically kneeling down, but my knees aren't what they used to be. Now that we've got some idea how to talk about them, stay tuned for our upcoming VR game reviews!